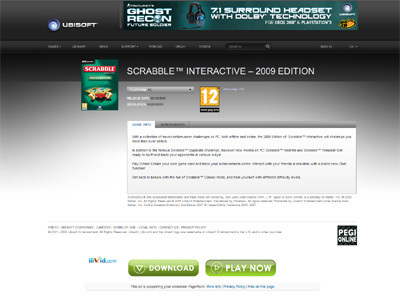 Scrabble Interactive 2009 for the PC is a great game for all you fans of the original scrabble game and the game is very slick and smooth running throughout. If you are a fan of scrabble then there is not much else I can say about this game as it features all the rules and so on of the traditional game. We have also compiled a Review System for this, of which Scrabble Interactive 2009 is Rated as Three Stars, the third highest possible score available from the Game Review Team.